Atal pension yojana with an objective of providing monthly pension to the citizens from unorganized sector of India was declared during the union budget of 2015-2016. The condition is that the citizen should not have any other formal pension benefits. The scheme aims to generate corpus for retirement. 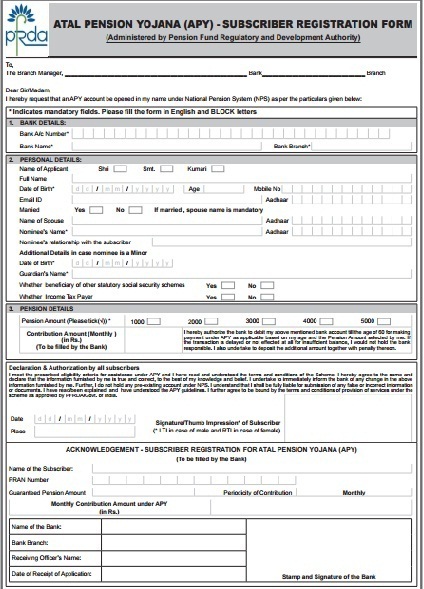 Once all the details are entered correctly, you need to mention – date, place and provide signature/thumb impression. If you are a male, provide left thumb impression. If female, provide right thumb impression. Keep this acknowledgement slip with proper care as you might need it any time in the future. Best is to take a picture and store it as a soft copy. Read more about the features of APY. If someone is a subscriber of Swavalamban scheme then that individual would be automatically migrated to Atal Pension Yojana unless they opt out. I would like to ask you My age is 14th April 1974 can I join this scheme ? great job by modi & his company, it is useful for future for downtrodden people. If subscriber death occure during contribution period and if after 60 year then will nominee get insurance?